Campus: Summer 2012- What’s it Like? Happy Summer Everyone! I hope you’ve made it home safely and are settling into your new schedules and arrangements. I am finially a college graduate! I am still up at the school, working on campus for the summer. Even after you leave in May, the college is still in the swing of things, preparing for your return and to welcome you back in August! Although they may be on a “summer” schedule, college offices are still open and summer classes are underway. For the past two summers, I’ve worked at the college in a variety of capacities including working Alumni Reunion Weekend, as well working in the student lead “Rock and Rollers” painting program. This summer, I am working for Media Services at the college. Many people have asked me what the college is like over the summer months (May-Early August). Students are here for 9 of the 12 months out of they year and many are curious as to what goes on while they’re at home. Well, I can begin with this: IT’S QUIET! There aren’t students shuffling from dorms or the parking lots to get to class. The campus quad is in pristine condition and occassionaly, you will find a few employees or students enjoying their lunch breaks at the various picnic tables. The EAC is, for the most part, empty and the Camelot Room is only open until 2:00pm daily. Needless to say, there’s no chaos and no one around. There are events that occur over the summer at the college including four orientation sessions for incoming freshman students, the annual alumni reunion weekend, as well as summer classes and summer camps for children in the neighborhood. Although school is technically “out”, the college continues to be a center of learning not only for students, but for the community as well. Although there are events, it’s still not the same as having all the students back on campus. Residence Life offers summer housing for on campus student employees, as well as students taking summer classes. Otherwise, the dorms are closed for the summer! This allows time for facilities to perform any work that needs to be done. Speaking of Residence Life, Centennial Hall is almost completed! It is slated to be completed by the end of June. The progress has been astonishing and if you’ve walked along Madison Avenue, you definitely could tell it’s near completiton. Centennial Hall will house upperclassman residents beginning this fall. It will feature a snack/convenience type store for students and the community, as well as a “burger studio” that will offer extended hours on the weekend, so students can grab something to eat late at night. I’m looking forward to seeing the final project! Finally, the one great thing about St. Rose over the summer? There’s ALWAYS a parking spot!! 🙂 Besides the occassional closing of Lima Lot for deliveries and to re-pave it, there’s always somewhere to park! Your parking permits are good until the end of August, so if you come for a visit, you will be fine. 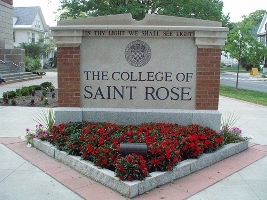 Be sure to check the St. Rose Security Website for more information and stay tuned for information about parking passes for the 2012-2013 school year!